I spent one Saturday exploring the Tinipak River in Tanay, Rizal, about 2 hours or so from Metro Manila. Tinipak River, which is located at the foot of Mt. Daraitan, a popular climbing spot near the metropolis. I woke up early to get a van from Star Mall in Shaw Boulevard; the trip to the town was uneventful. I then got a motorcycle to go to the village of Daraitan - about 22 kilometers over paved and unpaved, rocky two-lane roads. The driver told me that it was his first time to bring a passenger to Daraitan, and I think he was regretting it when we drove over the rough road. We have to stop a few time to ask for directions too. After a while we crossed a wooden bridge to get to the village. After I then paid the driver, and registered in the barangay hall. I got a guide, Michael, who will accompany me on the hike. The from village the hike to the rock formations is about 45 minutes to one hour, depending on the stops you're making. There were a number of people, mostly in groups, at some point on the trail. We stopped several times for me to unpack and assemble the drone. I managed to fly it with no issues on the first two instances, although it has a bit of difficulty acquiring GPS signals, we being in a deep gorge. It is something that I should have taken as a foreboding for something later on. Michael made some small talk and commentaries about the place and the visitors while we were trudging along the trail. The sun was almost high up, washing the landscape with a harsh light and making it look like a setting for a sci-fi movie set on an alien land. I can feel the sunburn coming as we continue. White boulders are everywhere, as if strewn by an ill-tempered giant done playing with his toys. The surfaces are almost smooth, the product of millions of years of water flowing through, carving the deep gorge where we passed. As we reached the end of the trail, the formations became more impressive than the ones we so far passed. 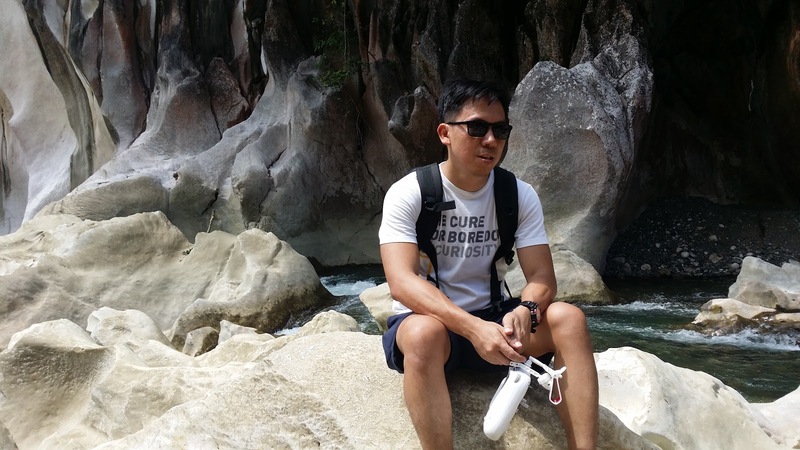 The gorge is very deep too (about 80 meters, according to the drone's data). I surveyed the place, admiring the magnificent view and surveying for a spot to launch the drop. I took some photos with my ActionCam and phone too. I assembled the drone after finding a suitable area. I turned it on and and waited for it to acquire its GPS fix, which it did after a long time. I launched it and it's kind of difficult to control, it drifting from side to side. I managed to take many great dramatic pictures. The great trip was ruined by what happened after I tried to land the drone. The plan was to let it hover a meter from the ground and then catch it, as there wasn't a lot of even surface in the area. We almost succeeded but then this idiot of a girl suddenly barged in while taking a selfie. She was almost hit by the drone; I was able to pull it just in time to avoid her face. The drone continued up, drifting on the side for a bit. I was struggling to control it, as it continued to ascend and drift. It veered to the right and clipped a branch of the tree growing at the top of the gorge. My heart sank as I see it fall, tumbling down and hitting the side of the cliff, then splashing into the water. Michael and I clambered over the rock to reach the other side. He also called another guide, who dove into the water to search for the drone. We managed to recover the body, which was immersed in the whirling waters. The gimbal was smashed to smithereens, and the battery was lost. The camera module, miraculously, did not fall into the water, and still intact with the memory card (and the priceless photos) inside it. It was a cosmic consuelo de bobo, if there was ever was one. I had to sit to gather my faculties while trying to dry the smashed drone with my shirt. I felt like crying, replaying the final moments before the crash and going over what should and shouldn't have happened. After a while I signaled to Michael that we should be going back. On the way we made a detour to a camping area with a clump of balete providing shade to rest. I took a dip in the river while I was there, hopefully to wash the regrets I had. When we reach the village I hired a habal-habal to take me to town, then took a van back to the metro. 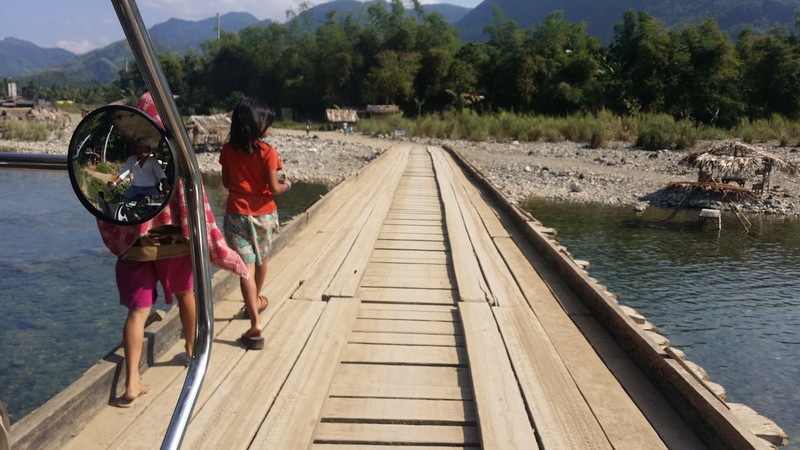 A guide, which is required before you can trek along the river, will cost PhP 500. You will also need to register at the barangay hall and pay a Php 20 registration fee. Bring plenty of water and some snacks. There is also a sari-sari store at the jump-off point where you can buy refreshments. You may take a van from Star Mall in EDSA/Shaw Boulevard going to Tanay, Rizal. The fare is PhP70. You can then take a tricycle to Daraitan (PhP100 per person). The tricycle will need to cross a bridge going to the barangay hall, you may need to pay for the toll.